Both Britain and Ireland are nations of tea drinkers; we drink more than anyone (the Irish drink even more than the British). Amongst all those tea drinkers, everyone has an opinion on how to make a ‘proper’ cup of tea. What is a proper cup though will always be subjective, it is what one person likes and that is not always the same for everyone. I like mine strong, dark and unsweetened, other like it weak and sugary. There are however certain qualities apart from the strength which is paramount to making a cuppa right. Tea comes from the plant Camellia Sinensis and depending on the post picking process, can become white, green or black tea. The first part of making a good cup will be using leaf tea (though in fairness, tea bags are much improved to what they once were). Black tea is by far the tea most used for general everyday drinking, and it is that tea we are talking about here. Because of the health benefits of green tea, it is growing in popularity. There is only one way that water will make a good cup of tea, and that is if it is boiling; not tepid, not kept warm in the kettle, never from the tap. No, the water must be boiling as you pour over the tea in the pot or even the bag in a cup. Start by filling the kettle with fresh water (once boiled the taste will not be the same as fresh water) and bring to the boil. Always warm the teapot with a little of the boiled water, swirl it around the pot and discard. Place one tsp of fresh leaf tea per person plus one for the pot into the teapot. Leave to infuse for 3 – 4 minutes, no longer or it will develop a ‘stewed’ flavour. 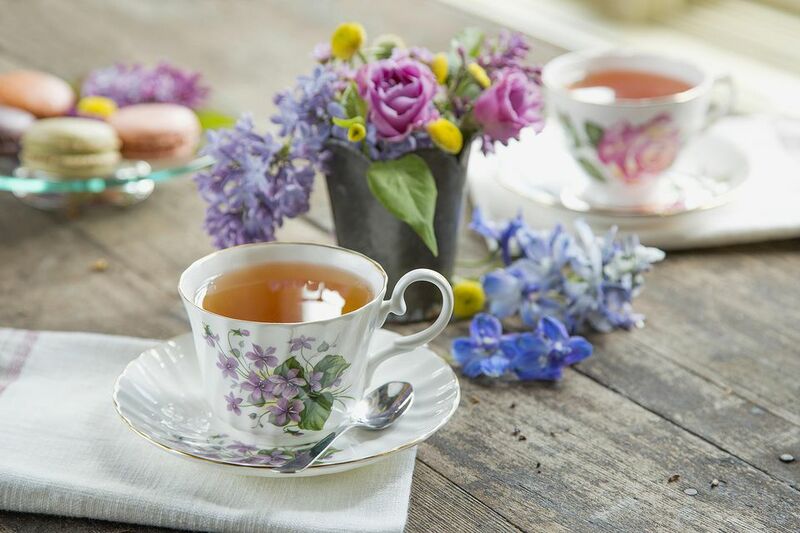 Pour the tea through a tea-strainer directly into clean teacups, China cups are one of the best to use, though why has never been proven; the tea just tastes better. Milk in First or Tea in First? Debate continues about whether to put milk in the cup before pouring or after. Originally milk was always poured into the cup before the tea to prevent the hot tea from cracking the bone china cups. Tea experts agree with this tradition but also state; to pour milk into hot tea, alters the flavour of the tea. The right teapot for the perfect cuppa is a matter if personal preference either metal (all early teapots were solid silver, ornate vessels) or china. A metal teapot will keep the tea hotter for longer but some feel that china keeps a finer flavour with no tainting from the metal.